This weekend, 90,000 members of the international music product industries will descend upon Anaheim, California, land of Disney, Mighty Duck and palm trees to attend the annual North American Music Merchants convention, otherwise known as "the NAMM show". 2013 will be a special year for NAMM, with as many traditions upheld as forgone. The show will be the first of its kind to take place in the newly built Anaheim Grand Plaza facility, a serpentine commons that yawns between the city's Hilton and Marriott hotels. According to the consortium's press release, the Fernand L. Petiot All-Industry Memorial Marching Band will relinquish its customary opening fanfare this year to the 50-piece 1st Marine Division Band from Camp Pendleton, who shall serenade show-goers with "'The Star-Spangled Banner' and other patriotic songs." Describing the wire-tapers' convention scene in The Conversation, Francis Ford Coppola characterized these trade-related events as "a mixture of a Masonic Hall and show business". An international house of handshakes. The MIDI manufacturer's association, or MMA, is also celebrating the 30th anniversary of the Musical Instrument Digital Interface - a protocol, a specification, a language spoken amongst music-making machines. MIDI was developed in the early 1980s by a group of five synthesiser manufacturers - Sequential Circuits, Roland, Yamaha, Korg, and Kawai - and quietly conferred in 1983. In January of that year, along with MIDI's chief engineer Dave Smith of Sequential Circuits, electronics pioneer Bob Moog demonstrated a MIDI connection between two synthesisers, a happening Moog recorded in a 1986 article as taking place "without formality or ceremony." But 30 years is a significant milestone worthy of ceremony for a standard that has endured in its original 1.0 dialect, while other networking languages are updated and replaced with exponential speed. And so, at this year's NAAM event, the MMA will launch their "MIDI Makes Music" campaign, a yearlong traveling roadshow birthday party to commemorate MIDI's mark on a constellation of industries and cultural activities around digital and electronic music. There are lots of stories around MIDI, and following are some of them. "It was a collaboration between five companies, though mostly Sequential and Roland," says Smith, who now operates his own boutique synthesiser company in San Francisco. "I was just the driving force behind it, to make sure it happened." In 1983, Smith's Prophet 600 synthesiser was the first to be connected via MIDI to the Roland JP-6, another machine designed with future interoperability in mind. Afterward, nearly every electronic music-making box that was used in a studio - in ever-more prevalent home studios, in schools and universities and other institutions of sound reproduction - was MIDI-compatible. The standard was intended to be universal, between different devices and different manufacturers. It was conceived of and sold as a revolutionary way to control one instrument with another, to create symphonies of synthesised sound - without the need for an actual symphony. But the data sent between instruments was just as much liberating as it was limited. In many ways, MIDI was a standard that produced its own usefulness. MIDI was a protocol arrived at by a few very interested parties, for a few very interested parties. At times those interests intersected, at others not, and it usually fell somewhere between. Cornell University Professor of Sociology Trevor Pinch believes that it was a satisfactory system for musicians, full stop - which is why it never underwent significant and official renovation. Along with Frank Trocco, Pinch is co-author of the 2004 book Analog Days: The Invention And Impact Of The Moog Synthesiser. Although it's what made it such an easy standard to implement, a chief criticism of MIDI was its simplification of musical properties down to crude discrete units. When I spoke with him via email last autumn, Pinch offered, "What I do know about MIDI is that it was a compromise that met specifically the goal of one manufacturer above all others - Roland - who had a synth ready." The story is similar to Jonathan Sterne's tale (MP3: The Meaning Of A Format) of the MP3: in every major musical technology there are trade-offs. With MIDI, you got control and compatibility and ultimately cheaper ways of making and controlling electronic sounds, but the richness of control and sounds in the analogue era was partly lost. "My analogue sequencer makes unique sounds you can't get from digital sequencers," says Pinch. "This partly explains the return to analogue sounds and controllers today." In the late 1970s, there were several splintering generations of young people who'd grown up listening to popular music made with synthesisers, poised to go forth, multiply, and purchase these cheap and compatible instruments as home entertainment systems, as artistic tools, as educational and therapeutic devices, and often as investments in dreams of stardom. Hybrid electronic gadgets were also entering into the public consciousness through their appearance in the concurrently emerging music video format; TV stations like MTV circulated images around the globe of spiky-haired rocktagon drummers and baggy-pants-clad keytarists. The geographical flow of these images and the tools they displayed, however, was heavily weighted in the West-to-East direction, and most of the young people who ended up with the technologies were boys. The majority of popular forms of music produced electronically during its long history are likely to be the work of a solo artist. MIDI is arguably in large part responsible for today's over-abundance of lone (and usually male) electronic music producers, regardless of talent or inspiration. The technical ability to solitarily create an entire compositional sound in an affordable home studio in the 1980s contributed to today's culture of auteurist electronica artists. This scene has individual producers practising personal and exclusive signatures - importantly, signatures that can also be applied to strengthen the symbolic weight of others' hegemonic documents - rather than writing an elaborate tapestry of music, negotiated and solved through necessary collaboration and inclusion. In many ways, the solo male artist became the whole equation of digital music, and its solution. It's too often taken for granted that, at their inception, music technologies expanded accessibility to music-making, and made untold ingress possible. These assumptions are based upon more or less homogeneous populations, and the literature proposing that computers would revolutionise music education was supported in many cases by the private sector - organizations like NAMM and the MMA, for example. Queen's University music professor Kip Pegley's research on gender and music technology in education sheds light on how MIDI's implementation in its infancy in elementary pedagogical settings further divided the sexes. Electronic instruments were sold to educational institutions en masse as part of music programmes aimed at simplifying and speeding up the practice of making music. They were seen as enabling devices that could be had at a nice price, saving both time and money, allowing one child to create entire symphonies, and eliminating the repetitive necessity of mastering multiple instruments, or indeed much musical skill at all. In the revealing 1989 case studies Pegley examines, girls were significantly more reticent to embrace MIDI-capable technologies than boys. Pegley contests the conclusions that generally tend to be drawn for girls' comparative reserve: that technology is a masculine terrain, and that girls who take a keen interest in it are more marginalised by their peers. Interestingly, Pegley stresses the importance of meaningful reiteration, looking beyond the simple rehearsing of these problematic explanations, and rethinking "how we define repetition and how we can differentiate useful from meaningless repetition". Pegley argues that, for girls, it's less about what's gained than what is lost: the seemingly repetitive and time-consuming practice that music technologies promised to make unnecessary and obsolete actually cultivate more profound relationships. She calls them "pen and pencil" instruments, those with deeper cultural histories, encouraging more profound connections to one another. As it turns out, practices and processes that were once assumed to be prohibitive and redundant are actually quite crucial to making music - even electronic music. It's the technologies that were designed to overcome these redundancies that have hierarchical levels of prohibition programmed into their language, as it were. Electronic music technologies in these instances replaced the experience of playing and mastering traditional instruments, which made for less deeply rooted and meaningful cultural experiences around music, Pegley maintains. Furthermore, they advanced a claviocentric and Western approach to musical culture and history. But surely MIDI-fied instruments have been around long enough to accrue their own lengthy traditions now? As the MMA is excited to celebrate across the trade show circuit, MIDI has been making music for 30 years. Nonetheless, whether or not those decades old traditions are preserved or discarded is just as much bound to be an aesthetic concern as it is a pragmatic one, and while MIDI enabled functional aspects in its early days, the sounds that can now be made with machines that incorporate electronics are less and less shaped by it than still beholden to it. Once MIDI is the network in place in an assemblage of machines, it immediately becomes regimented and arcane; things can get complicated quickly. Its use requires fairly high levels of technical mastery that are seemingly at odds with the impulse of music-making as an intuitive, real-time, and social practice. In her 1988 article Computational Reticence, MIT science and technology scholar Sherry Turkle advocated for more finely differentiated experiences with technologies; innovations in these areas are made most fittingly in the field of software development, or honed at the level of the interface, and not as much associated with the protocol itself. MIDI's modes require compliance; they're never-not standardised; they're ultimately about pure control; master devices, slave devices; one-too-many transmissions in a daisy-chain gang. MIDI may be an anomaly for a digital networking language, and 30 years of existence is commonly viewed as a testament to its durability. But, as Kittler would contend, languages are best tested on the battlefield, where commands must be immediate, direct, easily encoded and decoded, and difficult to corrupt. As a networking language, MIDI fares better than most - functional enough to communicate the essential orders. Nearly every electronic instrument could then (and still can) speak, understand, and transmit it in the studio and on the stage. In case of panic, there's an "all notes off" command. And most instruments will operate independently of it: they can produce the same sounds without being plugged into that network. Still, like a game of telephone, with children eventually muttering nonsense down the line, MIDI degraded across distances, and most damningly for time-based art forms, it lagged behind. Synchronisation was always a significant drawback for MIDI, and by the time the clock caught up (it took 27 years for MIDI to progress from 7 to 14 bit sensitivity) electronic music had moved outside time in other ways. Nostalgia has turned, over the past decade, toward early digital music - and the still-useful technologies and still-very-much-alive artists who made it - putting the past 30 years into sharp relief. The fashions for analogue and other pre-MIDI technologies are reflected recently in retro musical trends. And those who listen with an ear toward the future seem less concerned with digital technologies as with the alternating temporalities and granular textures they can represent - bypassing MIDI altogether, going through, written instead into the very codes of digital audio. Most tellingly, the bulk of MIDI's operations were re-enfolded back into a larger media ecosystem reliant on computing machines that are not necessarily dedicated solely to music-making, and in most cases are designed to become obsolete and be replaced, faster and faster. "I don't believe that there was some sort of MIDI conspiracy, if that's what you mean," says composer Chris Yavelow, who wrote frequently for a number of publications including the Computer Music Journal over the past several decades, on the topics of MIDI and other computer-based compositional tools. Yavelow studied music at Boston and Harvard Universities before writing the "Bible" of books on Macs and electronic music in 1992 (Macworld Music And Sound Bible). "Most keyboards retain complete functionality, even without the attachment of MIDI cables," he notes. 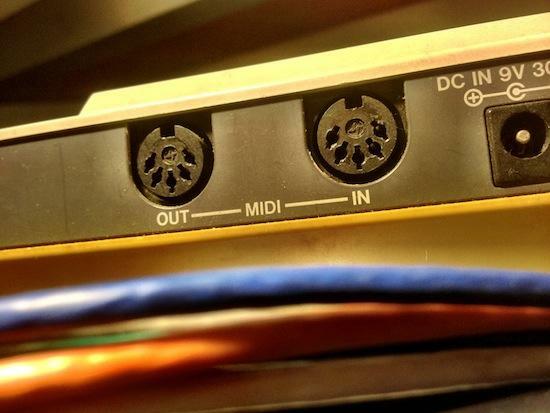 "Although, the same cannot be said about modular devices, mixers, effects, and other performance oriented gear" - often proprietary equipment that becomes a useless "brick" without the integration with other MIDI components. "For example," Yavelow elaborates, "MIDI interfaces would not sell very well without MIDI data to put through them. But I'm sure the manufacturers of MIDI interfaces made a decent profit by having the foresight to address the need for the boxes they brought to market." The real conspiracy runs deeper than MIDI. Since standing accused by the United States Federal Trade Commission in 2009 of organizing and facilitating price-fixing practices between music instrument retailers, even going as far as predetermining their resale values on secondary markets, the North American Music Merchants' association has offered to voluntarily comply with an order to not engage, in any way, in any form of antitrust-related activity in the future, and to kindly post a lengthy document on their website stating so, with details of the charges as well as the FTC's verdict - a gesture that in itself does not constitute an admission of engaging previously in any antitrust-related activity. The decision amounts to the usual slap on the wrist under capitalism, a stern "from now on" warning; a public declaration to henceforth comply with the US Federal Trade Commission's order to obey trade laws, and to do it with feeling. Still, it wasn't really MIDI, its developers, or even the manufacturers of electronic instruments who enjoyed those spoils. Dave Smith famously didn't walk away from his invention a wealthy tech tycoon of Kim Dotcom proportions, and seemed genuinely slighted that there wasn't at least a trickle of creative flow in the direction of his technology. "It has certainly had a huge effect on music-making from the very start. But since MIDI is still version 1.0, it's not clear that MIDI itself has benefited in the vice-versa case," Smith opines. "Companies that make software and hardware that utilize MIDI are heavily influenced by artists. MIDI is used every day, in every music studio and university, and in most PCs and cell phones." Over the past ten or so years, as computational power and processing speeds increased, new questions arose about whether or not MIDI was still at the vanguard of music made using digital instruments. In its first two decades of life, MIDI quietly became the most commonly used language amongst electronic music making machines; yet it's unclear whether it's still essential to future-looking and forward-sounding electronic music today - if that is still the impetus behind electronic music-making. It seems to me that the most compelling electronic music surfacing nowadays, whether new or archival, is contingent upon more improvisatory musical and non-musical relationships - within the less categorically-specific communities who make it - and the collaborative, differentiated, and not-yet-standardised sorts of control and mastery that artists develop over their ever-widening palettes. "Of course, MIDI enabled a whole new generation of digital musical artists to emerge," Trevor Pinch recalls. "It made equipment cheaper and more affordable, and I love electronic music enough to cherish that." Questions persist, though. Did its promise of cheaper, quicker, and more readily available music technologies make for more interesting, more culturally significant electronic and digital music? Just how complicated are the relationships between music and the technology artists make it with? How did MIDI and music write each other's histories? From my admittedly small data set, (using the "deep-learning-while-I've-got-you-on-the-line" mode of research) I couldn't reach many of its die-hard proponents. And I did try. Most seemed to use it in the simplest of possible ways, or not at all - at worst, a resignation to a kind of happiness in slavery. Perhaps corporate giants of computational and communications technologies reaped the broadest swath of rewards from a protocol, an archaic 30-year-old language that was, at its ideological extremes, developed for the sheer fascination of it by aficionados of all things technical and electronic musical, and implemented quickly by a handful of instrument manufacturers for the competitive edge they believed it might hold - the boxes upon boxes that would be sold. "MIDI was done by synthesiser companies," Smith reminds me. "Our main goal was for our own industry to grow. MIDI certainly scored well in that department, and we all sold a lot of instruments." So, should you or a loved one happen to be at the NAMM show in Anaheim this particular weekend, do visit Dave Smith's booth to marvel at his Mopho X4 polyphonic synthesiser, and give thanks to a gentleman held with revolutionising the music of our age. At very least, stop in for a chat and a handshake.